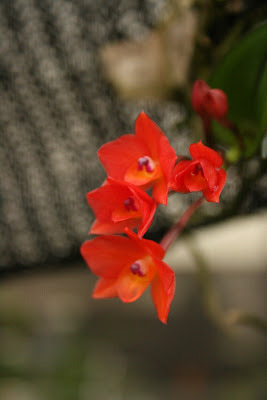 There are many reasons to grow species orchids. Conservation awareness, the challenge, being among the first to flower a previously unknown species, etc. For as intriguing as they might be, many species of orchids are simply slow growing and can require a considerable investment in time before the first flowers are produced. Over the past few several years, I have bought many species orchids seedlings. For some reason, many of them are producing flowers for the first time this year. Almost two years to the day, this is the first from flower from a batch of deflasked seedlings of Phragmipedium besseae 'Firehouse' x 'Cow Hollow II'. It will be interesting to see if the seedlings vary in flower size/color, number of flowers per plant, vigor. etc. Another beauty flowering for the first time is Sophronitis (now, and again, considered a Cattleya) cernua 'H & K' x self. This came from Mountain Orchids in Vermont. The color of the flowers in the photo is a bit misleading. They are more of a peachy-orange. This is a fantastic miniature orchid. Although not the first time this bizarre species has flowered for me, it's a plant that I always seem to forget about until the flowers emerge in November. Bonatea speciosa is a terretrial orchid native to South Africa. While not difficult to grow, it appears to be nearly impossible to find in the trade. This is strange considering the fact the it self-pollinates and sets copious amounts of seed that is apparently quite easy to germinate. If anyone out there is interested...let me know! 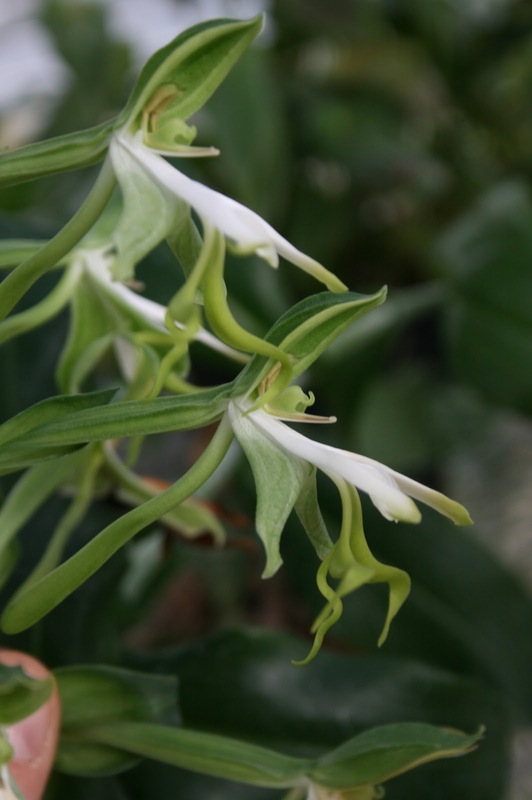 I am quite smitten with the Dendrobium species of section Calyptrochilus. 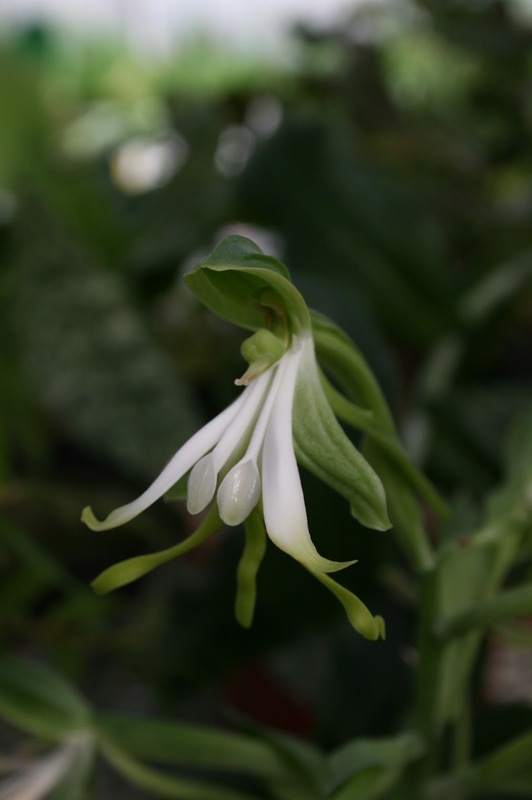 These species have the capacity to bloom throughout the year, the individual flowers are very long-lasting and come in a wide-range of colors, and the are quite easy to grow in moist, shaded conditions. This Dendrobium glomeratum (sulawesiense) (also on the label from Andy's Orchids was "giant lawesii"). I have had this orchid for several years and it spent most of that time producing one vary large and long cane that has now produced this massive inflorescence. As you can see, the inflorescence is as large as my fist! Cattleya maxima is one of the most rewarding orchids that can be grown. It grows well mounted or in a container, and blooms reliably each year. My plant, originally obtained from the now defunct Hoosier Orchids, is spectacular this year. The flowers of Cattleya maxima are fragrant and last for 3-4 weeks in prime condition.